GAS STATION (LARGE) Window Insert MULTI- COLORED TA-437 $2.00 This insert fits in the window of the Large Gas Station. 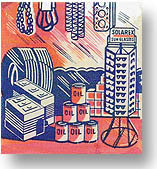 GAS STATION (SMALL) Window Insert MULTI- COLORED TA-438 $2.00 This insert was used on the later issues of the Small Gas Station. 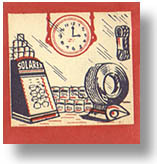 GAS STATION (SMALL) Window Insert MULTI- COLORED TA-439 $2.00 This insert was used on the early issues of the Small Gas Station. Insert MULTI- COLORED TA-441L $2.00 This insert goes in the left window of the Hardware & Drug Store. Insert MULTI- COLORED TA-441R $2.00 This insert goes in the right window of the Hardware & Drug Store. 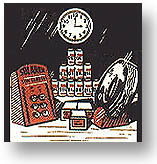 This insert goes in the left window of the 1853 TAN front wall version of the Hardware & Drug Store. This insert goes in the right window of the 1853 TAN front wall version of the Hardware & Drug Store. Siren GRAY TA-212 $3.00 This fits on the roof of the Hospital. This chair is commonly found missing. There are four of these chairs that go with the second floor furniture of the Hospital. This desk chair is the piece of furniture that is most found missing. It goes with the desk that is included in the second floor furniture of the Hospital. HOUSE UNDER CONSTRUCTION Hoe TAN TA-44 $2.00 See: House Under Construction. HOUSE UNDER CONSTRUCTION Rake TAN TA-45 $2.00 See: House Under Construction. HOUSE UNDER CONSTRUCTION Shovel TAN TA-46 $2.00 See: House Under Construction. HOUSE UNDER CONSTRUCTION Bucket TAN TA-47 $2.00 See: House Under Construction. (3 pieces) TAN TA-48 $2.50 See: House Under Construction. LOADING PLATFORM Chimney DARK BROWN TA-7DB $2.00 Goes in the roof of the Loading Platform. The color should match the walls of the building. LOADING PLATFORM Chimney DARK GRAY TA-7DG $2.00 Goes in the roof of the Loading Platform. The color should match the walls of the building. LOADING PLATFORM Chimney LIGHT BROWN TA-7LB $2.00 Goes in the roof of the Loading Platform. The color should match the walls of the building. LOADING PLATFORM Chimney LIGHT GRAY TA-7LG $2.00 Goes in the roof of the Loading Platform. The color should match the walls of the building. LOADING PLATFORM Plasticville Sign BLACK & WHITE TA-427 $1.50 This die-cut sign folded in the middle and the tabs were inserted in the roof of the Loading Platform. LOG CABIN Chimney BROWN TA-220 $3.00 This chimney spans the two roof half’s of the Log Cabin. (3/set) These flowers come on a single sheet that are easily trimmed and they fit in the walkway of the Motel. See all three flowers.